Your project’s specs likely demand it. Your pride of craft demands it. Certainly, your good business sense demands it. Complying with the ASTM F2170 standard when conducting an in situ relative humidity (RH) test in concrete is not optional. Fortunately, any Rapid RH® system you select makes ASTM F2170 compliance easy. Three key components of ASTM F2170 compliance are calibration, traceability, and documentation. Each sensor must be properly calibrated to provide accurate, reliable readings. Each sensor must have a certificate of calibration directly traceable to a standard reference material provided by NIST, the National Institute of Standards and Technology. Without this NIST traceability, the accuracy and reliability of your sensor readings are in question. Clear and complete documentation is needed of each of your RH readings, including when and where you use each sensor. Both the Rapid RH®4.0 EX (single-use) and 5.0 (reusable) Smart Sensors are properly calibrated right out of the box, so you can use them immediately and be confident of ASTM F2170 compliance. Every Smart Sensor pack comes with an NIST-traceable certificate of calibration. Each certificate is imprinted with its unique number and date of issue, making its traceability unassailable. Since the 4.0 EX is single-use, you never need to do any future calibration checks. The NIST-traceable certificate you get from Wagner Meters verifies it was properly calibrated. No RH sensor is easier to use than the 4.0 EX. On the other hand, ASTM F2170 specifications require reusable sensors be checked for calibration within 30 days before each use. Additionally reusable sensors must also be re-calibrated or replaced after each year of use. These compliance requirements have been the drivers for making reusable sensors less convenient to use. The investment in calibration verification equipment plus time and labor to conduct the calibration checks, can be significant. Also considering that after one year of use, you will have to purchase a replacement sensor for each Rapid RH 5.0 test you have. You will have to crunch the “per-test costs” to justify if it is cheaper to buy single use or reusable sensors. What about the compliance requirement to test each reusable sensor within 30 days before each use? The Rapid RH®5.0 reusable Smart Sensor was designed to make that as pain-free as possible. Wagner Meters developed a system that would revolutionize the current technology and significantly reduce your costs in verifying the calibration of each sensor. Each Rapid RH® reusable Smart Sensor comes with its own EasyCare CalCheck™ (patent pending) storage unit. Unique to the 5.0, this unit provides your reusable Smart Sensor with the optimal storage environment to maintain calibration. You test and verify calibration by simply taking an RH reading while the sensor is stored in its EasyCare CalCheck™ unit. Instead of taking hours using the special equipment that other reusable sensors require a calibration check for the 5.0 reusable takes just seconds. All you need to do to maintain the integrity of the EasyCare CalCheck™ unit is to add a little tap water into one of its chambers when the water level gets low. That’s it. Of course, it’s not enough to maintain and document proper calibration. 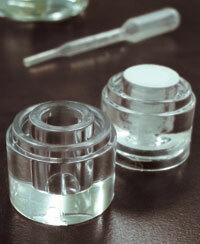 ASTM F2170 compliance also requires documentation of the sensor’s actual use and test results. Here, Wagner Meters offers a variety of tools to easily collect, document, and report your test results. The “Floor Map and Data Grid” provides the framework you need to ensure you’re documenting all the ASTM F2170 required information. The map helps you document all the floor locations tested. The data grid lists all the types of data you need to collect, along with cells to enter your specific data. It won’t let you forget a thing. The DataMaster™ app lets you upload your data directly to a reporting website for ASTM compliance. It also creates a PDF report of sensor calibration compliance. Another feature of the DataMaster™ app is that it gathers all the required calibration data into a table that can be emailed directly from your mobile device. Regardless of which electronic data collection option you use, we’ve made ASTM F2170 compliance simple. The DataMaster™ app lets you upload your data directly to a reporting website for ASTM compliance. 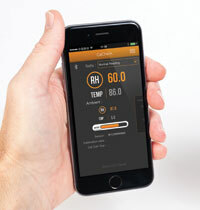 The CalMaster app creates a PDF report of sensor calibration compliance. Since both the single-use and reusable Smart Sensors make ASTM F2170 compliance fast and easy, you can’t go wrong no matter which option suits you better. Where can I find what RH % numbers mean? Is there some sort of standard level that corresponds to certain types of floor coverings as to what is and what is not acceptable? Where can I find what all this data is supposed to mean? I have done projects where the readings were in the high 90’s and was given a Hold Harmless agreement and told to proceed and years later the job is still in perfect condition. In other words what does 88% mean compared to 96% and so forth? Acceptable RH% levels for installation vary from product type to product type and sometimes from manufacturer to manufacturer. The range I have seen is from 75% for direct glue down wood to 90% for VCT. This is very general and I would always recommend you contact the flooring and/or adhesive manufacturer to obtain their specific moisture thresholds. 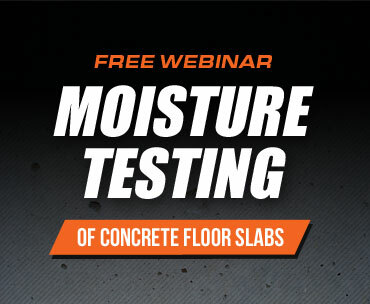 We also offer an online resource that links to different manufacturer’s installation guidelines at http://rhspec.com/manufactures-specify-rh-testing/ If you look under subfloor preparation, you should find the information you need.